entrer: is an invitation to take a stroll through the traces of five committed architecture projects that have recently left their mark on the Belgian landscape. There is a former chapel that houses the reserve collections of the museums of the city of Mons (by Atelier Gigogne + L’Escaut), a sports centre that has redrawn a landscape in Spa (by Baukunst), an industrial conversion that reinforced the centre of Dison (by Baumans-Deffet), a footbridge that transformed a public space in Brussels (by MSA + Ney & Partners), and a garden pavilion in Renaix that articulates a professional kitchen and an art collection (par Vers.A). But how to convey the materiality and spatiality of architectural projects located miles away from the exhibition venue and therefore removed from their specific context? Architecture produces spaces and atmospheres that can be grasped and understood through the physical discovery of the place. The stroll emerged as not only a tool by which to grasp the spatiality and materiality of the projects, but also as an analytical method and as a medium to convey the results. It was the occasion for Audrey Contesse, curator of the exhibition, to glean and select objects relating to the history of the project and to architectural practice, and for the artists, Maxime Delvaux and Christophe Rault, to draw from it films and sound bites, respectively. These independent fragments – gleaned objects, films and sound bites – form five triptychs through which to enter, experience and understand these architectures. The entrer: catalogue completes the exhibition. It proposes other types of analyses of the architectural projects, which are also inspired by the idea of the “walkabout”, in the same vein as the exhibition. Five international architecture critics - Pierre Chabard, Asli Ciçek, Francesco Della Casa, Phineas Harper and Sebastian Redecke - offer their personal approach to the project in a short and substantiated text. In-depth interviews between the curator and the architecture firms give insights into their positioning, approach and specific practice. Visually, the projects are illustrated by five flipbooks that each represent a sequence of an architectural walkabout of the buildings by photographer Maxime Delvaux. A particular book form that Laure Giletti and Grégory Dapra have drawn into a dialogue with the texts in a book that is a work of art in its own right. five architectures in belgium: process and materiality. Round table moderated by William Mann and Audrey Contesse with architects from Baumans-Deffet, Baukunst, L’Escaut, MSA et Vers.A. Conversation between Christophe Catsaros, editor in chief of TRACÉS, and Audrey Contesse, curator of the exhibition. Round table with Chantal Dassonville, director of the Cellule Architecture from the Fédération Wallonie-Bruxelles, and Francesco Della Casa, cantonal architect of Geneva, moderated by Audrey Contesse. Round table moderated by Audrey Contesse with architects from Baumans-Deffet, Baukunst, L’Escaut, MSA and Vers.A. Audrey Contesse is an art historian and architect. Currently, she is freelance journalist, editor & curator in the field of architecture. She works as journalist for, among others, L’Architecture d’Aujourd’hui, A10, Werk, bauen + wohnen and published texts in several books. She was previously editor and editor in chief of A+ Architecture in Belgium (2006-2015) and editor of A+ Editions for the books Belgian Architecture beyond Belgium (2012), Filip Dujardin. Fictions (2014) and Inventaires (2014). In 2009, she curated the series of movies and lectures on the landscape and landscape architects in Belgium called 5/5 at Institut Supérieur d’Etude du Langage Plastique in Brussels. She is also one of the co-researchers of the project Usus/Usures by Rotor for the Belgian Pavilion of the Venice Architecture Biennale 2010. Maxime Delvaux is a Belgian photographer specialized in architecture photography. In 2012, he collaborates to Post City, the project for the Luxembourg Pavilion for the Venise Architecture Biennale with Philippe Nathan, Yi-der Chou and Radim Louda. 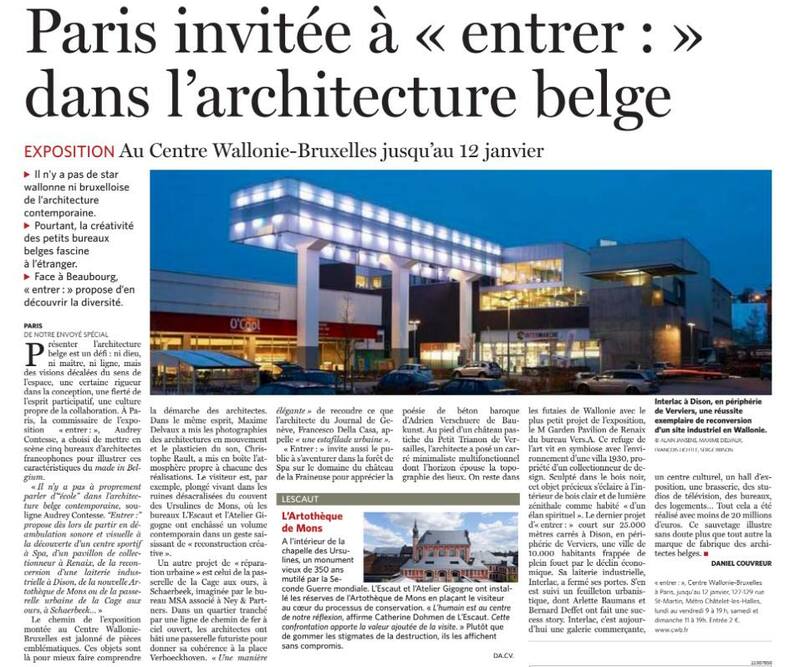 In 2013, he carries out the whole photography series of the Inventaires#1 book for the Wallonia-Brussels' Architecture cell. In 2014 he worked with architects Sebastien Martinez Barrat, Bernard Dubois, Sarah Levy and Currator Judith Wielander on the project for the Belgian Pavilion at the Venice Architecture Biennale. He realized the whole photographic research for the exhibition. These 250 pictures were published in the book Interiors. Notes and Figures. That year his work about the power of propaganda in North Korea, DPRK 2012 was part of the Korean pavilion of the Biennale and also presented at the Charleroi museum of photography. Born and raised in Brussels, Frédérique de Montblanc left the motherland at 18 to go on a long artistic journey which brought her first to Montreal where she completed her BFA in Theatre at Concordia University in 2004. She then flew to Los Angeles to further her practice in video art, performance and set design. She obtained her MFA from CalArts in 2007 then got dragged by a Texan cowboy to Houston where she worked on several projects as a director and set designer with the Dominic Walsh Theatre Company, Pascal Rambert and the Mercury Baroque Music Ensemble. Since she's been back in Europe, she created the sets and costumes of I Would Prefer Not To by Selma Alaoui for which she was nominated at 'le Prix de la Critique 2010-11' . Her set design work also includes Les Buveuses de Cafe by Compagnie Mossoux-Bonté, and more recently The Two Character Play by Tennessee Williams directed by Sarah Sire as well as Mas-Sacre choreographed by Maria-Clara Villa Lobos. Her film and installation work has been exhibited in various art centers and galleries in Los Angeles, Houston, Brussels and Paris. She just presented her first short film: Malta Kano, TX at the Brussels Short Film Festival on April 28th at Flagey. Eurogroupe is a Brussels based graphic design office founded by Gregory Dapra and Laure Giletti in 2013. They design publications, websites and identities in collaboration with artists, architects, theorists and curators. They have worked with the Piet Zwart Institute (Rotterdam), Science Po (Paris), Spector books (Leipzig), Roma Publications (Amsterdam). In 2014 they made the catalogue and visual identity for the Belgian Pavilion at the Venice Architecture Biennale. Gregory Dapra and Laure Giletti gratuated from the Werkplaats Typografie (Arnhem), and respectively from the École de Recherche Graphique (Bruxelles) and the École Nationale Supérieure des Arts Décoratifs (Paris). Christophe Rault is a sound artist, radio producer and musician. Co-founder of Arteradio.com in 2001, main producer until 2008. Now living in Belgium, he works on his own project (drama, features and creations) while working for many radio authors, in charge of the sound recording, editing and mixing. He also organize workshops and conferences about radio languages (BBC, WDR, RSR, acsr Brussels). Involved in the Atelier de Création Sonore Radiophonique de Bruxelles (acsr.be) he is programmer of Monophonic 2014 radio festival. Received several awards for his work (Prix Europa, Prix Scam France et Belgique, Prix festival Longeur d’Ondes). Exhibition between September 27th and October 13th 2017 at The Cass, London. Exhibition from February 23rd to March 12th 2017 at Festival d'Architecture de Liège. Exhibition between October 4th and 14th 2016 at the Sicli’s Pavilion in Geneva. Exhibition from November 5th 2015 to January 12th 2016 at the Centre Wallonie-Bruxelles in Paris. vidéo: intérieur du lieu 33"